Ecology versus politics. Can a tree become the subject matter of heated political discussion? 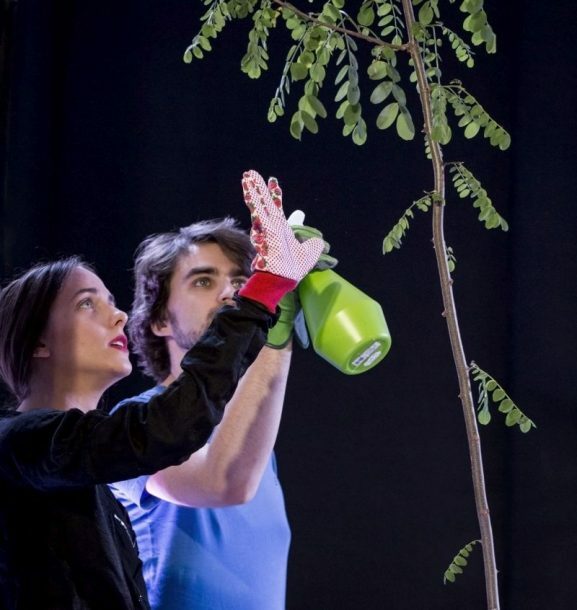 In this production, the young creators deal with the Hungarian nation’s relationship to the (false) acacia. The black locust tree is in fact native to North America, but over three hundred years it has become the Hungarian national symbol and Viktor Obrán’s spear wielded against the European Union, which seeks to limit the negative impact of false acacias on the environment. And we observe a pristinely political drama without pathos but with a good deal of irony and satire. PROFI - 10€ - theatre professionals and journalist. Theatre professionals and journalists are entitled to a special PROFI CODE for the discount. You can request a code by email (guests@nitrafest.sk, tickets@nitrafest.sk). You will need to fill in the profi code in the last step when ordering tickets. There is a limited number of discount tickets available. Your discount entitlement will be checked at the box office purchase or the entrance to the auditorium. Please have the respective ID card ready. Visitors entitled to discount can only purchase one discount ticket per performance. How to shop your tickets? Price category Student/ Senior you can apply directly in your order. How to change the full price into student/senior? 1. Choose your place for the full price. 2. Add the ticket into the shopping cart. 3. There is an option to roll on prices under the Price incl.VAT. click on the little triangle and select student/senior price. 4. Keep on purchasing or go to the payment. The event is available only online at Predpredaj.sk (not available at pre-sale.com). Predpredaj.sk allows you to buy tickets online for various musical, cultural, sporting and other events. You can also choose from a wide range of courses, adrenaline experiences, products and services. We do not even forget the smallest ones, for which we have children's camps and interesting events. After making a payment, you can print your tickets.